Never worry about looking for your keys when trying to unlock your door again! The XFL-02SN 3-in-1 deadbolt from MiLocks installs like a normal deadbolt and allows access by the included RF keyfob, numeric codes, or using a regular key. Add an Insteon Milocks controller to make this a smart lock. 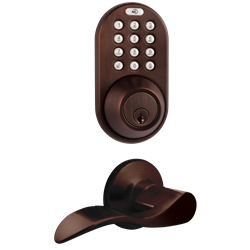 This model can have a combination of 10 key fobs, remotes and codes operating at any given time. Smartphone control can be enabled through the INSTEON home automation system. Stop worrying about lost keys - let the family use codes instead of keys. Give a temporary code to maintenance people or other visitors. Set up a master code for property managers. The XFL-02OB comes in an oil rubbed bronze finish. The package also includes two keys and an RF remote. Batteries are not included. Adjustable latch with 2 backset settings of 2 3/8” and 2 3/4"